Next Limit (https://www.nextlimit.com/) are authors of the Maxwell Rendering software and recently announced the availability of a plugin for Paintshop that supports images generated by Maxwell, in the .MXI format and allows them to be 'tweaked' in the familiar Paintshop surroundings. The plugin allows you to modify light intensity and the color of emitters, which is similar to the Multilight function provided in Maxwell Studio software. Bunkspeed UDRIVE is a new generation automotive specific visualization, communication and collaboration software, architected for simplicity, which allows anyone to quickly create photo real images and movies for presentation and review. Design visualization is now a fully automated, iterative task that fits in the entire process, all the way from review of the first digital model through final press release images. 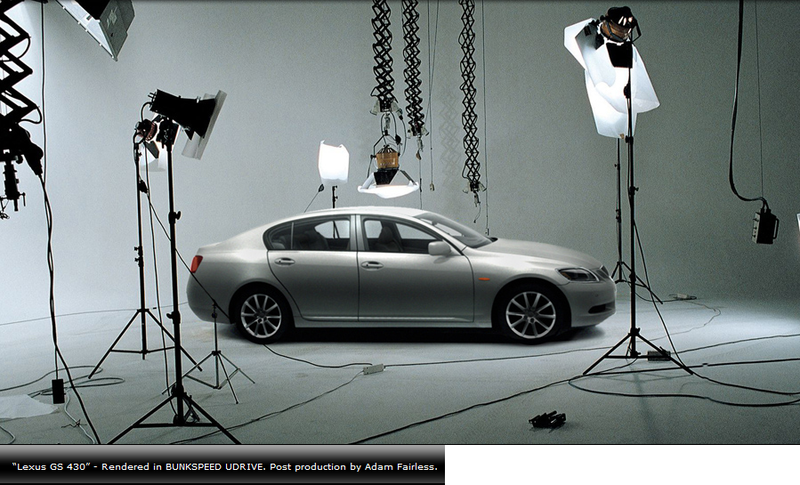 Bunkspeed UDRIVE is a fully integrated real time and print rendering solution for automotive and design industries. It is software that can be purchased off the shelf or as a complete solution including computer and projection hardware. In order to run UDRIVE effectively an Nvidia Quadro FX3400 or newer, an ATI FireGLX2 or newer is required. UDRIVE also is fully multi threaded in its ray trace renderer so the faster the processor the better. Multiprocessor and multicore processors are best and UDRIVE is also scalable over render clusters. Is any other hardware required? Although you can control UDRIVE fully with a keyboard, we recommend an interactive application controller such as a standard wireless playstation controller for collaborative interaction. Ford Motor Company has selected BUNKSPEED's software solutions to be implemented globally in the product design and development process. The initial agreement for 150 licenses of software for Ford and all its subsidiaries including Volvo, Land Rover, Jaguar, Aston Martin as well as Mazda, is expected to grow significantly as deployment is completed. Since its foundation in 2002, BUNKSPEED has been working closely with Ford and the Premier Automotive Group. The overall capabilities and ease-of-use of BUNKSPEED's solutions have compelled many design departments in the industry to rethink their design development workflow. By reducing the dependencies on physical prototypes, companies are finally realizing significant cost savings throughout their design processes. Photo editing software allows digital images to be blurred, warped or re-colored at the touch of a button. However, it is not currently possible to change the material appearance of an object except by painstakingly painting over the appropriate pixels. Here we present a method for automatically replacing one material with another, completely different material, starting with only a single high dynamic range image as input. Our approach exploits the fact that human vision is surprisingly tolerant of certain (sometimes enormous) physical inaccuracies, while being sensitive to others. By adjusting our simulations to be careful about those aspects to which the human visual system is sensitive, we are for the first time able to demonstrate significant material changes on the basis of a single photograph as input. Blender is fully free to use and distribute within any educational, professional or commercial environment. Artwork created with Blender - including python scripts - is the sole property of the creator. CSI (CADDSoft Solutions Inc.) have released Concepts Unlimited version 3. Concepts Unlimited targets Macintosh® and Windows® design communities who need fast, flexible, and intuitive tools for turning ideas into precise 2D and 3D designs. Typically creating photo realistic renderings requires a certain level of expertise regarding the lighting, reflection, and refraction associated with a scene. Version 3 eliminates this necessity for beginner users with the introduction of Rapid Render Environments. Now all users can quickly create impressive renderings with a press of a button by choosing either a metal, plastic, glass, or mirror render environment. These new rendering tools do all the work for the user with respect to adding lights, materials, drop shadows, and environment maps; turning everyday users into rendering wizards. For those users wanting more control over a scene, Version 3 adds the ability to drag and drop environment maps into scenes. An environment map is a 2D image that is reflected back onto 3D objects. Environment maps are a great feature for adding visual realism to a scene without having to generate and position additional 3D objects. The photo rendering tools can be combined with the newly introduced animation tools which can be used to explode assemblies or to simply animate objects and cameras along paths. Gelato® is a software program that uses the NVIDIA® GPU as a floating point math processor to provide hardware accelerated rendering. Gelato can be downloaded and used for free. Nvidia's aim is to enable high-quality rendering for everyone: 'Render Everywhere' appears to be the theme. Geomerics is a Cambridge based company specializing in advanced graphics and physics technology. At this years Game Developers Conference (GDC) they are announcing a new solution to overcome problems faced by game developers with lighting and shadowing technology. Geomerics has utilized the power of ‘geometric algebra' to provide exciting and innovative solutions to geometric problems in real-time. This technology is poised to transform computer graphics in gaming, providing a major step-change improvement over the current state-of-the-art in terms of speed, achievable effects, and ease of programming - its also GPU friendly. ARTVPS will become an OEM partner of mental images to integrate mental ray in 64bit versions of its RenderDrive hardware rendering product and mental images will license intellectual property from ARTVPS. Read the Press Release for further details.